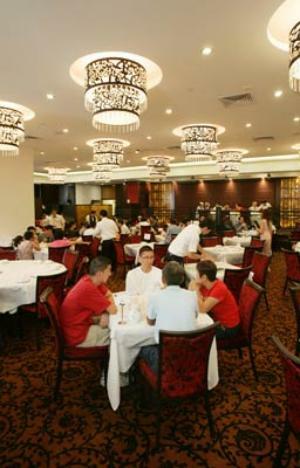 Chinese banquet restaurants have been on the wane for several years. Without a guarantee of large parties most nights of the week, the resources and manpower needed to keep these large spaces running are unsustainable in slow times. In the Ala Moana Center area, there hasn't been a banquet-size Chinese restaurant since China House closed, but judging from the crowds at the recently opened Jade Dynasty Seafood Restaurant, I realize how much it's been missed. Those planning parties will find the space includes a 32-foot-wide stage and seven private rooms with sound and video systems, located in the fourth-floor Hookipa Terrace space that was formerly home to Kyoto Osho. Jade Dynasty is the first of what the Feng Shing Restaurant Group hopes will be many more of its restaurants in the West. The company owns more than 20 restaurants in Hong Kong, frequented by the city's rich and famous. Here, the restaurant looks impressive on the outside. Inside, it looks better by day, when sunlight mutes and softens the decor. At night it becomes more obvious that the interior could have used an edit. The mix of Asian chic, sparkling crystals and plastic laminate gives the room a dizzying cabaret-meets-bordello ambience. It's best to ease into the menu by day, when prices are more affordable. Even so, dim sum here, at about $3.50 for typical items, is about double the cost of small Chinatown restaurants, so for some this will be a special-occasion treat. To add elegance to the experience, they've done away with the usual dim sum-laden carts in favor of creating delicacies fresh to order. What that means is, you don't get the instant gratification you'd get elsewhere, but you also don't get the claustrophobic chair back-to-chair back bumping that comes from pushing tables close together to create aisles for carts to pass. Delivery of food is chaotic and piecemeal as the Dynasty crew doesn't seem to have an orderly system for matching orders to what's coming out of the kitchen. That's fine if you want your dim sum to arrive in 10-minute intervals, but I prefer to see everything all at once so I can pick and choose from the assortment in front of me, and in the order I want to eat it. But servers here are pleasant and let you know they aim to please, acknowledging your every request, something that isn't guaranteed in Chinatown. Dim sum here comes closer to Hong Kong delicacy than most, with the ideal light, thin wrappers with prized transparency that allows you to see their contents. Greens in shrimp-spinach dumplings ($3.50) and shrimp-and-chive dumplings are melt-in-the-mouth tender, so you don't get the reedy rawness of chives served elsewhere. Some selections I haven't seen elsewhere are crystal taro buns ($3.50), also served in typical dim sum flour wrappers. It's not something I'd order again because the texture of the sticky, soft shell and sweetened mashed taro are too squishily similar. Then there is deep-fried shrimp toast ($3.50), a short of cross between French toast and omelet, with a single piece of shrimp topping the deep-fried, egg-dipped toast. I might order this again if I were in the mood for a more Western-style dish. Other things I'd try only if I had money to burn, like dim sum containing fresh orange juice ($3.50). I think I'll always prefer my OJ in a glass. A highlight of the day menu are a batch of $7.95 specials, an inexpensive way to try some of the restaurant's best dishes, like fork-tender special roast salt duck ($7.95) and barbecue pork with honey sauce ($7.95), which is just another name for excellent, fresh-made char siu. In the evening, it might be best to stick with your tried-and-true, no-fail favorites -- you know, your kung pao chicken ($13.95), honey-glazed walnut prawns ($16.95), beef with broccoli ($12.95) and the like. It's my duty to try some of the more unusual selections, and I found it to be a wildly mixed experience. What stood out on the menu was a list of shark's fin (legally imported) soup offerings, from $15.95 to $49.95. They'll have to sell a lot before the shark's fin ban kicks in July 1. Instead, I opted for the minced beef soup ($11.95), a plain-tasting tofu and egg white soup with the consistency of jook. This and many other selections would be perfect for anyone feeling under the weather. There are usually many this time of year. I was drawn to a photo of Szechuan-style fish in a spicy broth ($17.95), but the &quot;broth&quot; turned out to be mostly chili oil that was undrinkable. I'm assuming the Szechuan beef in spicy broth ($17.95) is the same. In the comfort food category, there is fried rice with dry scallops and egg whites ($13.95). A picture, misleadingly, shows whole, fresh scallops, which are not in the dish. Similarly, there is a stir fry of egg white with crab meat and scallop ($16.95), a luxurious dish with the consistency of a savory pudding, which derives most of its flavor from the sprinkling of dry scallop. I didn't notice crab meat at all, but if you're in the mood for warm comfort food, it hits the spot. If you want an alternative to something like Mongolian beef, you can have your stir-fried beef marinated in red wine ($16.95), French-style, the menu states, but the technique and flavor remains Chinese, through and through. The highlights, as at breakfast, was the duck, this time a tea-smoked ($17.95) version cooked fresh on the spot. This, as well as the char siu, are worth coming back for many times.